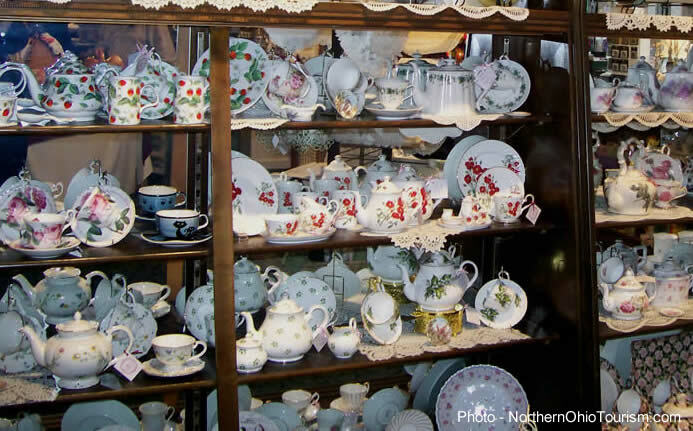 Enjoy a cup of tea at one of Northern Ohio’s area tea rooms. One of my favorite things to do is grab a family member, friend or friends and enjoy an afternoon of tea. It’s a wonderful way to slow down and enjoy great conversation. It’s also a great way to explore new areas. 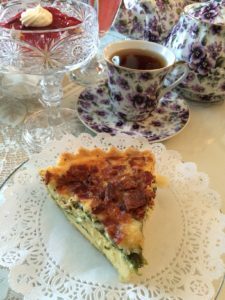 Over the last year, I have taken time to enjoy tea at some of Northern Ohio’s area tea rooms. 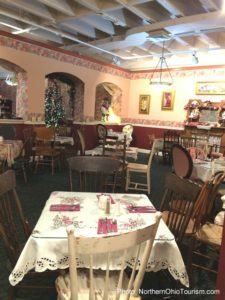 Below you will find information about those tea rooms, as well as our #MyOhioFun Road Trip notes, listing additional areas of interest near each tea room. As I continue to visit Ohio’s tea rooms, I will update the list. It’s always a good idea to call ahead for reservations, since many of the tea rooms may already have bookings or hosting a special event. 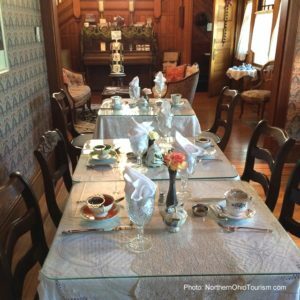 A few years ago I had to opportunity to bring my “Fall in Love with Ohio” bus tour to this charming Victorian tea parlor located on the Square in Burton, OH. Quintealia’s Tea Parlor resides in the historic Ford House, a 1891 mansion built by George H. Ford, Burton’s first mayor. Since my tour, I have taken others to enjoy tea at the tea parlor and every time we are not disappointed. 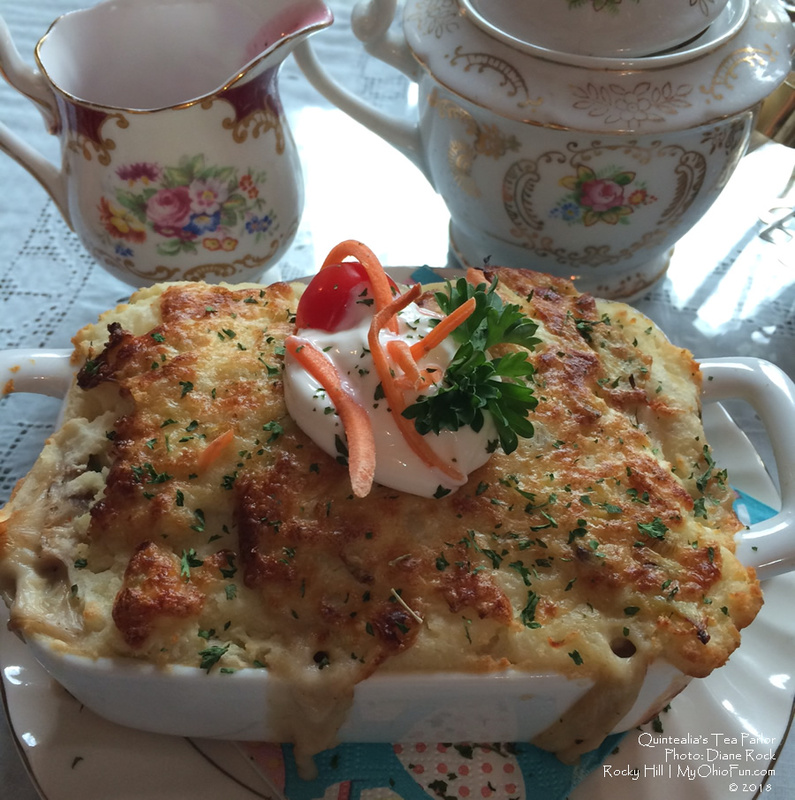 Two of my favorite dishes to order are the Beef Cottage Pie and the Farmer’s Market Quiche. Your visit would not be complete without enjoying one of their fresh baked scones, served with Devonshire cream and jam. Dessert selections include scones, pie, bread pudding, cheese cake, and more. Both owners, Annette Phillips and Renee Petro are such a pleasure. For those who want to plan a group event, they are very easy to work with. Burton Log Cabin and Sugar House, Century Village Museum, Buckeye Chocolate Company, Craft Cupboard at Settlers’ Village, Rothenbuhlr Cheese Chalet, White House Chocolates, Punderson State Park, as well as various Amish Shops and Fowler’s Mill. 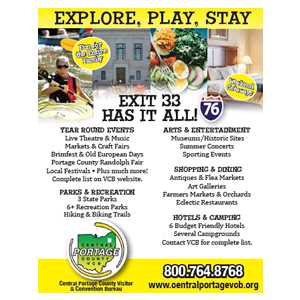 For our one day trip through Geauga County click here. 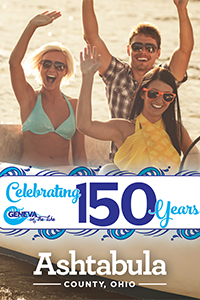 For even more things to do in the area visit Destination Geauga. 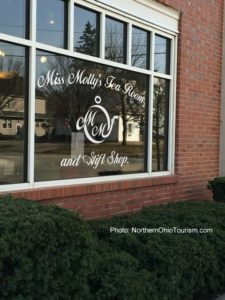 For those who live around the Medina area, they already know about Miss Molly’s Tea Room. 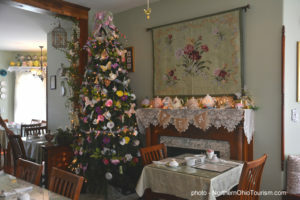 This Victorian decorated tea room is located just off the square in Medina, yet close enough to enjoy area shopping. Miss Molly’s offers a wonderful selection of tea delights as well as a gift shop. Over my last few visits I have enjoyed the Chicken Salad Croissant, the Quiche, and the Chicken Divan. 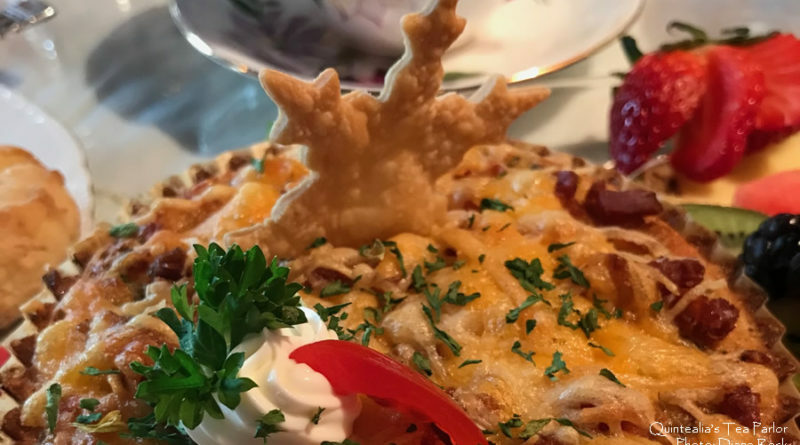 Menu options include: Miss Molly’s Featured Lunch, Chicken Divan, Quiche, Chicken Salad Puff, Chicken or Tuna Salad Croissant, Harvest Turkey Sandwich, and a Tea Room Lunch Salad. Sides include soup, a Strawberry Pretzel Salad, Chilled Cranberry Salad, Cucumber Salad, and a Broccoli Salad. Desserts include fresh baked scones, Italian Ice Cream Truffles, Lemon Tea Bread, and additional homemade desserts. Miss Molly’s also offers a wide selection of tea choices. 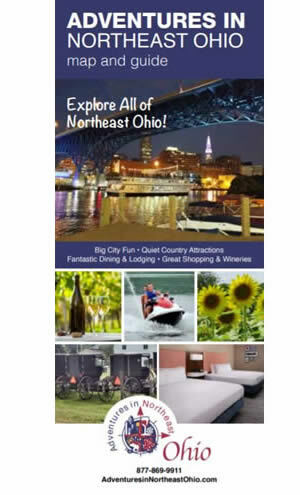 Area attractions and shopping include: Castle Noel, Root Candle Company, A Cupcake a Day, Fabric Obsession, The Gardener’s Cottage, Medina Antique Mall, The Olive Tap, Perfectly Charming, The Raspberry and The Rose, Polish Pottery, and more. For our one day trip through Medina County click here. For more information about things to do in Medina County visit the Medina County Convention and Visitors Bureau. 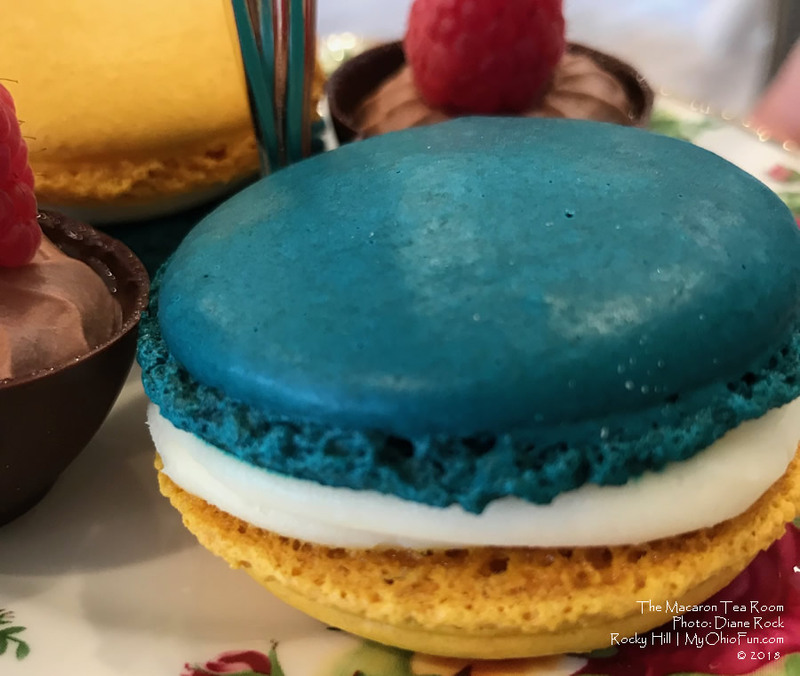 Opened in 2017, The Macaron Tea Room is the brain child of owner Alla Yakimiv. Upon entering you will be greeted by a display full of macarons, those very tricky to make but delicious cookies. 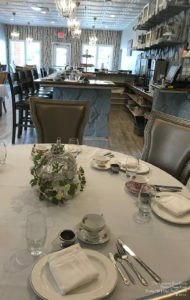 The tea room has a modern twist, with touches of silver, large cushioned chairs, chandeliers, and a granite bar for those who just want to come in and enjoy a cup of tea or sandwich. The day we visited, we enjoyed the “Afternoon Tea”, which consisted of a 3 Tiers. 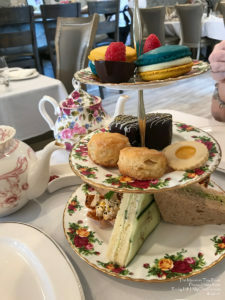 The Top Tier included one Macaron and chocolate cup, the Middle Tier included a scone, sponge cake, and tea biscuit and the Bottom Tier consisted on three tea sandwiches, which included a Cucumber and Cream Cheese & Chives sandwich. A side of clotted cream and jam was also served. Everyone agreed the delicious scones had a very unique taste. 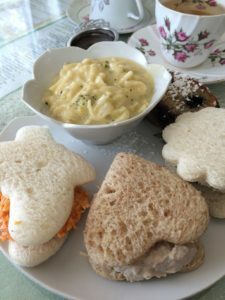 The favorite tea sandwiches were the cucumber, the egg salad, and the roast beef. The cost for the Afternoon Tea was $25 per person. Single pot of organic gourmet loose leaf tea $5. Tea choices include, specialty blends, traditional black and white teas, as well as green teas, fruit teas and caffeine free teas. 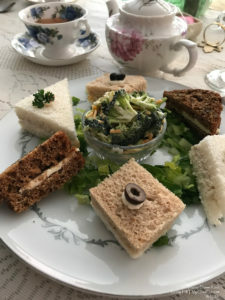 The tea room also offers a Vegan and Keto Tea. Tuesday-Saturday-11 a.m. – 3 p.m. 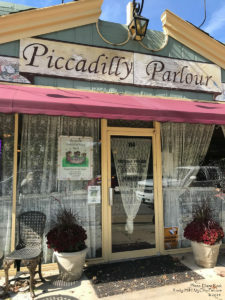 Located in Canfield, Ohio you will find the Piccadilly Parlour Victorian Tea Room. This Victorian decorated tea room offers a nice selection of teas to choose from. Throughout the year the tea room hosts special event teas. The day we visited we enjoyed the Piccadilly Trio (pictured). The trio consisted a selection of three (3) tea sandwiches, a cup of soup and a side salad. The price at the time was just under $14. The cost for a pot of tea for two was $3.29. Location: 114 S. Broad St. The tea room menu items included tea sandwiches, quiche, soup, various salads, scones, and desserts. A children’s menu was also available and gluton free items. Click here for current menu. 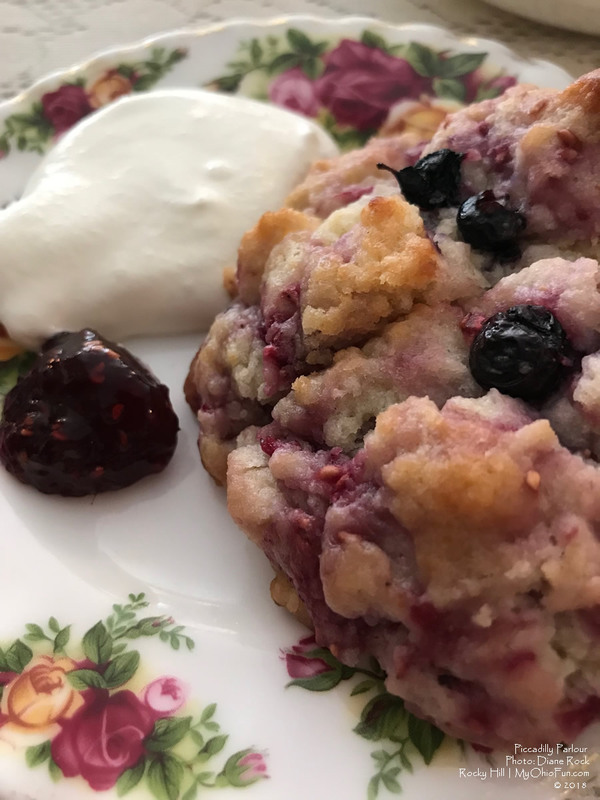 For dessert, we enjoyed a delicious berry scone with jam and cream. A stop to White House Fruit Farm should always be on your list. Also, a quick 20-minute ride from the tea room is The Butler Art Museum of American Art, and the Fellows Riverside Gardens, located in Youngstown, Ohio. Both are well worth a visit. 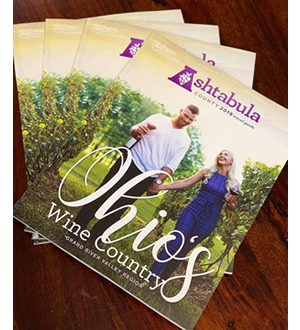 The #WinesoftheValley – Youngstown Area Wine Trail begins March 1, 2019 and runs through September 29, 2019. Visit area wineries and earn a special wine glass charm. For further information about the trail click here. 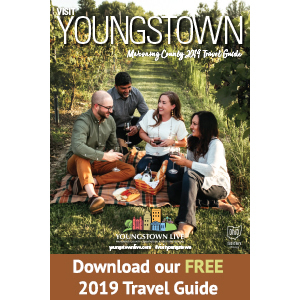 For more area events visit youngstownlive.com. 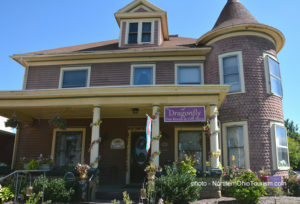 This past summer I ventured to the historic town of Canal Fulton to enjoy tea at The Dragonfly Tea Room. 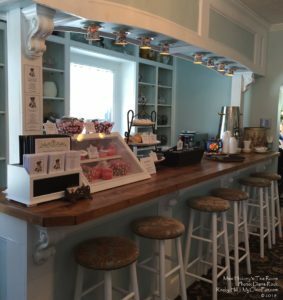 This adorable tea room is located right on S. Main Street in the heart of town. The day I visited the special was a cup of their homemade soup with three (3) of their petite sandwiches. The soup was a delicious broccoli noodle soup. My sandwiches included a pimento cheese, a chicken salad, and a tuna salad. I also enjoyed a delicious pot of their Garden Tea which I ended up purchasing a bag in the gift shop to take home. The St. Helena III Canal Boat where you can enjoy public boat rides (seasonal), Canal Fulton Glassworks Glass Studio & Art Gallery, Keillor’s: A Teddy Bear Shoppe, and the Canal Fulton Canoe Livery. 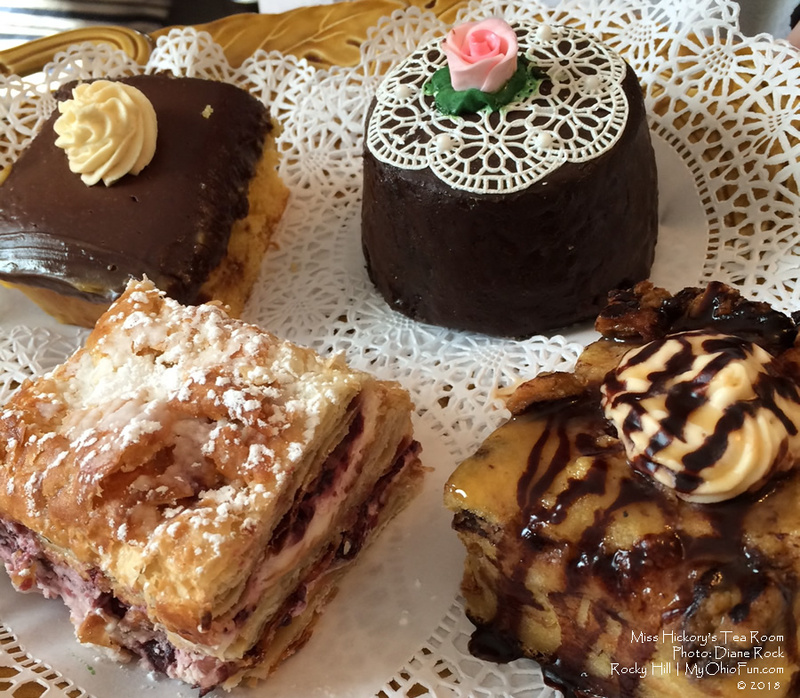 Miss Hickory’s Tea Room resides in the home of Strongsville’s first blacksmith. 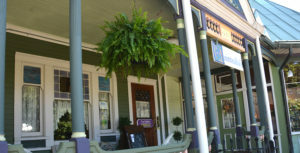 Owners Joe and Cona purchased the 1830 farmhouse and converted the historic home into the tea room. When you enter the front parlor you will be greeted by friendly staff and a “tea steeping station”. Make sure you check out the cute tea cup lights. The staff is dressed in early 1900’s attire, and the whole atmosphere will make you feel like you have stepped back in time. The day we visited we ordered the quiche of the day, along with the strawberry pretzel side salad. For dessert we enjoyed the Signature Chocolate Cream-Filled Cake. Reservations are not required, but I would strongly recommend them. Cleveland Metroparks, South Park Mall is just up the street, Maplside Farms, and Strongsville Historical Society. Every year some of our area historical homes offer themed teas. One such historical home is the Hower House Victorian Mansion, located on the grounds of the University of Akron. This beautiful 28-room Victorian mansion is a Second Empire Italianate structure, built in 1871 by Akron Industrialist, John Henry Hower and his wife, Susan Youngker Hower. The home includes unique treasures and furnishings collected by the Hower Family during their travels around the world. Self-guided tours are available throughout the year and during the holiday season the home is lovingly decorated by volunteers. 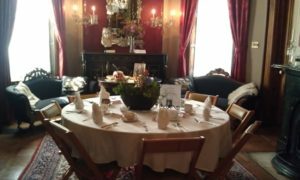 Over the past few years the volunteers of the Hower House open up the home for special teas. The tables are arranged in the dining room and parlors on the first floor. It’s a wonderful treat to dine alongside the homes treasures. The cost of these teas are approximately $34 adults/$23 children ages 8-12. Upcoming teas are always posted on their website. Shopping is also available in the Cellar Door Store, which includes tea cups and tea pots, jewelry, and unique seasonal items. For additional information about area tea rooms and tea events click here. * PRICING – Each tea room reserves the right to change their pricing. Pricing shown is what was available at the time of the article. Editor’s note: Part of this story ran in 2018. The dates and additional events have been updated for 2019. Any use of the above article or images without prior permission, will be in violation of copyright laws.